Below is the transcript, in reverse chronological order, from the Steve Jobs keynote at the Macworld Expo. Thanks for tuning in! 10:44am: Newman stopped talking, Steve thanked everyone for coming, lots of applause, it’s over. 10:35am: Newman finishes signing and is now talking about SJ being a hard act to follow, then cracks some jokes. 10:33am: Newman signing song in defense of America, starts by saying the leaders in the US aren’t good, but not has bad a Caesar….seriously. 10:16am: 1.6ghz or 1.8ghz Intel Core Duo. 10:11am: SJ pulls it out of a standard inter-office/manila envelope (that small). It’s incredibly thin. 10:05am: Gianopulos explaining the Apple/Fox deal with a Homer Simpson iPod graphic. 9:57am: Apple TV now comes built in with Flickr support, including friends browsing. 9:33am: Steve Jobs still demoing iPhone features, including the partnership with Google for maps location. New version of iPhone OS available for download NOW. 9:19am: Time Capsule comes in 500gb for $299, 1TB for $499. 9:13am: lights are dimming. Get ready everyone. 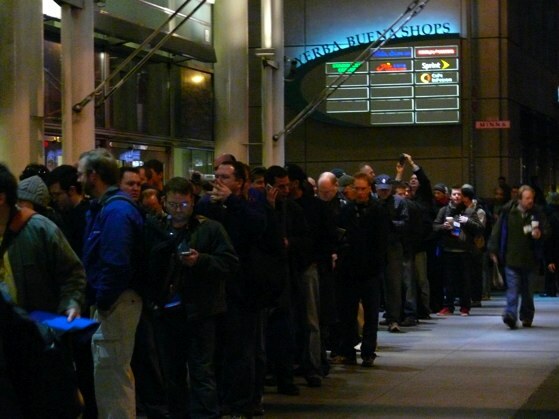 7am: early risers were queued four deep for a block around the Moscone Center West waiting for entry into the keynote.